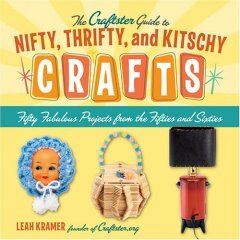 A banner ad on Craftster prompted me to take my first in-depth look at the book The Craftster Guide to Nifty, Thrifty, and Kitschy Crafts, published in 2006 by Leah Kramer, founder of Craftster. The book is packed with so many fun projects (most of which are recycled or repurposed crafts), including a popsicle stick purse, book clutch purse and plastic bottle piggy bank. There are “fifty fabulous projects from the fifties and sixties” in all, which are ready to be passed down to a new generation.